HomeBlog Kichadee: A Great Source of Protein! Kichadee: A Great Source of Protein! One of the most common questions I receive when it comes to food is, “How do you get enough protein if you’re a vegetarian?” Actually, most Americans get way too much protein and believe that protein is only available from meat and animal sources. The truth is, you’re probably getting plenty of protein from the vegetables, legumes, and grains you eat! Mung beans are one of the most cherished foods in Ayurveda. They are tridoshic, good for everyone. They can be eaten to balance all three doshas, especially when cooked with dosha appropriate spices. They are very nourishing, while being easy to digest – they do not generally create abdominal gas or bloating, the drawbacks of larger beans. Persons with low ojas , who are ill, or who are cleansing are often recommended to eat kichadee, a combination of rice, mung beans, vegetables, and spices. Mung beans have ability to provide a good level of nourishment without overtaxing the digestion. It is best to soak them for 1-2 days, changing the water daily before cooking. Mung beans can be eaten on their own or combined with vegetables and greens to make hearty soups or ground into flour to be used to make crepes or added to breads. Turmeric, cumin, dried ginger and coriander are some spices that work very well with mung beans. 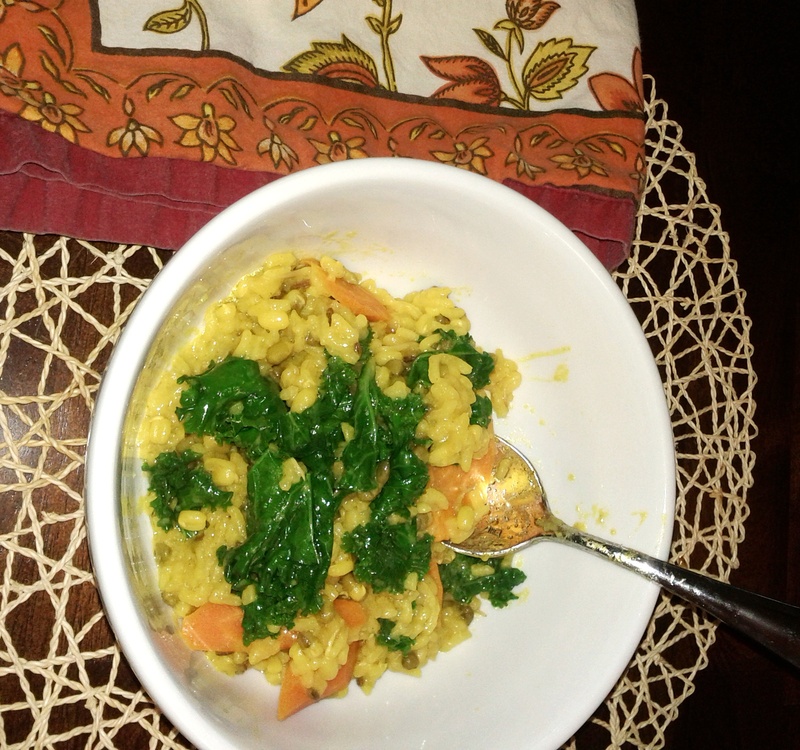 A staple of an Ayurvedic diet, Kichadee (meaning mixture) mixes savory basmati rice, mung beans, and a blend of healing spices for a light and flavorful dish. Kichadee is a delicious, gluten free meal. This delicacy is for the truly health conscious and busy person like yourself. Kichadee is rich in Protein, Calcium, and Iron. Mung Beans are a good source for dietary fiber, provide about 14 grams of protein per cooked cup, and contain Vitamin C, Calcium, Magnesium, Phosphorus and Potassium. A blend of spices adds a balance of basic elements: Earth and Water for increasing energy and immunity, Fire for stimulating digestive enzymes, and Air and Ether which aid in detoxification. Freshly cooked Kichadee, eaten with 1 teaspoon of Ghee (clarified Butter) provides the right amounts of macronutrients – complex carbs, protein and fat. It builds good tissues, thereby building our immune system. Mung beans are easy to digest, so in many digestive problems, Kichadee is a good staple. In Ayurvedic detox therapy – Kichadee is the only food that is recommended. With his ageless axiom “Let your food be your medicine and your medicine your food,” Hippocrates, regarded as ‘the father of medicine’ might as well be referring to kichadee. In fact, kichadee is the most perfect therapeutic recipe of all because it detoxifies the entire system, while kindling the body’s digestive fires called ‘agni.’ Unlike other fasts or restricted diets, an exclusive diet of kichadee for one to several weeks with the addition of steamed seasonal vegetables, fresh fruits, and a few tablespoons of yogurt mid-day, is the safest and best way to lose unwanted pounds and will supply you with all your nutritional needs. This is one meal you will walk away from feeling nourished, satisfied, and will help to reduce cravings! Here is my favorite kichadee recipe – I just made this yesterday!! !